The last day of the year is a time to reflect on the achievements of the year gone by that have resulted from ‘the four Ps’ – patience, persistence, perseverance and practice! And as we reflect on these achievements we also look forward to 2019 and setting ourselves new goals and challenges. There have been many achievements both small and large at Top Notes Music Studio throughout 2018, but I particularly want to highlight the following quiet achievers who have worked consistently throughout the year and made strides in developing their playing skills. Grace Chen who has only been learning flute for five terms, successfully auditioned to move from Training Band to Intermediate Band at her primary school. Caitlin Handel fulfilled a long held ambition to join the NSW Public Schools Milennium Marching Band. Caitlin will be working hard on her steps as well as memorising her flute music in 2019! We look forward to seeing Caitlin in the ANZAC Day Parade, and at the Schools Spectacular later in the year. Ankhita Sekhar successfully auditioned to move from the Junior to the Senior Band after only one year at her high school. Well done Ankhita! join the Junior Rising Stars program at Sydney Conservatorium of Music in 2019. We look forward to hearing them perform in the Gala Concert at the end of Semester 1. Hannah is pictured here performing at a nursing home during her last school holidays. And then of course there are all the students who undertook exams and participated in the Hills District Junior Music Festival this year. Details of their successes can be found here. Each one of you is to be commended for your hard work and putting yourselves on the line to develop your skills and achieve your goals. Top Notes Music Studio is looking forward to another successful musical year in 2019! There has been much in the media over the last few years about how learning music helps students in so many other aspects of their academic and social development and this Top Notes Music Studio student is a perfect example. Adhav was elected Band Leader for his school band at the beginning of 2018 and assumed the role and its attendant duties with a great sense of commitment and responsibility. It has been reported to me that he attended every Band rehearsal, even those for which he was not rostered, which involved many early morning starts throughout the year, and that other parent helpers said they could not have done the job without his assistance, as only Adhav knew where everything was kept. Adhav was also willing to jump in and assist the percussion sections of junior bands when required. Adhav has shown a big increase in maturity and confidence this year, so much so, that he is now working consistently towards his first AMEB flute exam in 2019. Congratulations Adhav – we here at Top Notes Music Studio are all very proud of you! her AMEB Grade Six Flute exam with a High Distinction this year, Clara has successfully auditioned for the Junior Rising Stars program at the Sydney Conservatorium of Music and will now move into an environment where she will benefit from tuition from some of Sydney’s finest flute teachers and performers. Clara is no stranger to the Sydney Conservatorium of Music where she is already a piano student in the Junior Rising Stars program and has completed her Certificate of Performance on Piano with Honours as well as the AMEB Music Craft Grade Four examination. Posted in Flute, Music Teaching and Learning, Music Theory, Piano, Uncategorized. So proud of Top Notes Music Studio student Hannah and her younger brother Sam who gave up a whole day of their school holidays to travel to Bowral with Sam’s clarinet teacher, Lindsay. 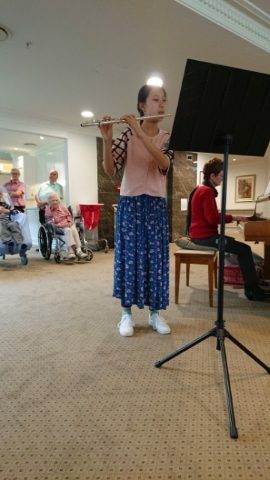 Hannah and Sam both performed on piano, and then took to their second instruments flute, and clarinet, to entertain and delight the audience of the nursing home with their performances. It was a special moment for Sam and Lindsay, as Lindsay’s mother is a resident and was in the audience. Congratulations to both young people for such a lovely way of sharing their talents and giving back to the community. Lindsay said, “They played beautifully. I am so proud of them both.” Performing for audiences is also a great way to work on overcoming those performance nerves and developing confidence for more stressful situations like exams and auditions. What Makes a Good Musician? Over the last couple of weeks I have been asking my students for their thoughts on What Makes a Good Musician? We compiled them all on a poster and I was very impressed by the insight and sophistication of some of the answers from my younger students. Clearly, it is never too young to start the conversation! Posted in Music Teaching and Learning, Musicianship, Performance Skills and Tips. Top Performances at the Hills District Junior Music Festival Today! It was a pleasure today to accompany three wonderful students who participated in the Music Teachers’ Association of NSW Hills District Junior Music Festival. Joyce Chen (pictured) earned a Third Place against 13 competitors in the Intermediate Section, whilst her younger sister, Grace, gave her first public performance in the Novice Section. Charlotte S also gave a wonderful performance and earned a Second Place from a field of 11 competitors in the Late Intermediate Section. I was so proud of all the girls who put a lot of effort into polishing their performances and delighting the audience with their contributions. Top Marks to these Top Notes students! Posted in Flute, Musicianship, Performance Skills and Tips. Another year is fast drawing to a close at Top Notes Music Studio, exams are done, reports digested, results celebrated, and resolutions made for things to work more intensively on next year! It is now time to congratulate all the students who took their nerves in hand and put themselves on the line to have their playing and their years efforts assessed. 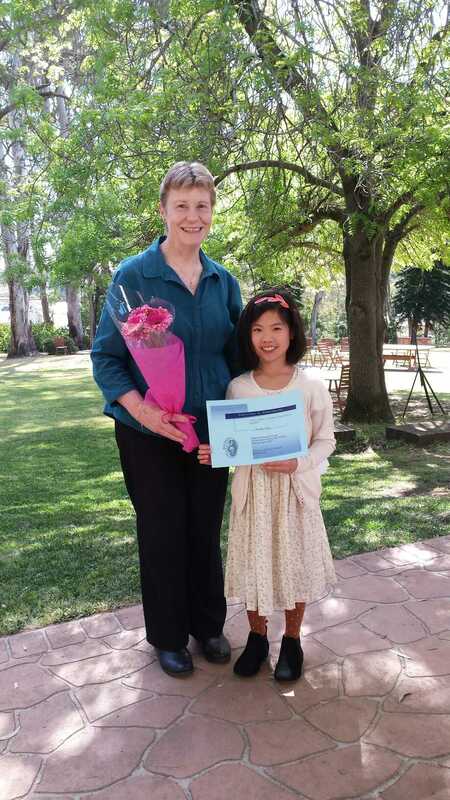 Here they are: Caleb Chan – Grade 6 – Credit; Charlotte Choy – Grade 1 – High Distinction; Alyssa Collins – Grade 3 – Credit; Caitlin Handel – Grade 4 – High Credit; Clara He – Grade 5 (Recital) – High Distinction; Anika Pandey – Grade 1 – Honours; Caitlin Power – Grade 8 (Recital) – High Pass; Charlotte S – Grade 4 – High Pass; Hannah Wang – Grade 2 – Honours. 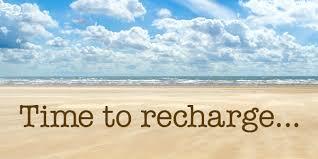 Well done everybody – a relaxing holiday is now well deserved! Posted in Flute, Music Teaching and Learning. Ten Top Notes Music Studio students had a wonderful day showing off their talents last Sunday when they participated in the Music Teachers’ Association of NSW Hills District Junior Music Festival. It was wonderful to see many students come well prepared and smartly dressed, and give impressive performances of pieces they have worked so hard on over the last few weeks. Caitlin Handel and Anish Joseph received Participation Certificates, and the following students received special commendations from the adjudicators. A special mention should be made of Charlotte Choy who was also awarded a Highly Commended for her piano performance in the Intermediate section. Well done to everyone for participating – and being the only Woodwind representatives in the entire Festival! Three Top Notes Music Studio students entered for AMEB exams in this mid-year session, and I am very excited to report that all of them were awarded As (Honours) passes and glowing comments on their reports! Congratulations to Clara He and Carol Xu who did Grade Four, and Joyce Chen who did Grade Two. Fabulous results and well earned rewards for regular and consistent work. Well done girls!! Special thanks too to Clara’s Mum, Amy, who accompanied Clara and Carol so proficiently for rehearsals and on the day of the exams. 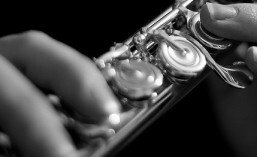 Posted in Flute, Music Teaching and Learning, Musicianship, Uncategorized. It has been a very exciting week for Top Notes Music Studio, Pravin Chanmugam, his family and myself as we received the wonderful news that Pravin had been successful in his AMusA (Associate in Music, Australia) diploma exam conducted by the Australian Music Examinations Board. At the age of 17 this is an outstanding achievement for Pravin, who is now entitled to use the letters after his name! 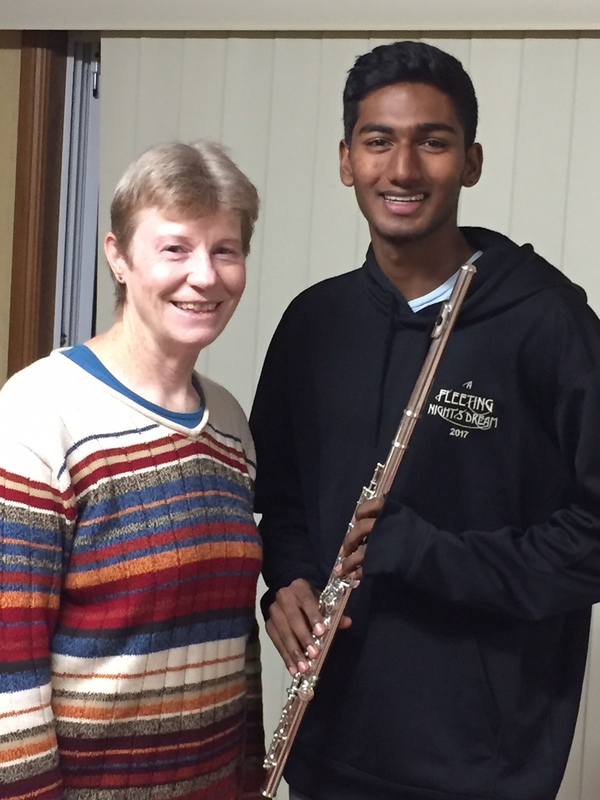 Pravin’s achievement will also be recorded on the Honour Board in his school’s Music Department, where he will be the first student in the school to have achieved the AMusA on Flute. Pravin has managed to juggle preparation for this exam with many other extra curricular activities in a schedule that makes me feel positively exhausted just hearing about it! He has been supported every step of the way by devoted parents who have been real partners in his musical journey. 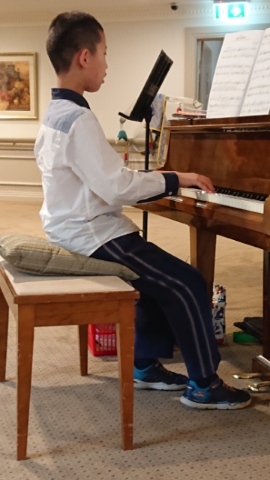 Thanks should also go to his brilliant accompanist, Anne Hopkins, who has been available for rehearsals late into the evening, and flute teachers Melissa Hoile and Jocelyn Fazzone who have given Pravin additional lessons, tips and pointers over the last few months. I’m looking forward to some more relaxed times with Pravin playing duets in the months to come as he prepares for his next challenges – his driving test and the HSC!